I borrowed the name "The Boar's Den" from an artist friend who referred to his room like that... and in his case it was an apt name indeed. But it was also "catchy" so I casually used it one night with my friends Peter and Helen at dinner early in my smoking experiments. I had not had the time to properly clean up and decribed my place as a "boar's den" (and crediting my artist friend for the original). But around the table they jumped on it and said that was definitely the right name for the place. So I designed the sign (used for the banner above) using my ancestral clan crest as a focal point since the Boar was a central theme. I wanted to recreate a sense of the old meeting house atmosphere where conversation was the primary entertainment. "The Boar's Den" has become my personal "Meeting House and Barbeque Palace" where I can prepare and serve friends some delicious smoked meats while we entertain ourselves with serious conversations and discussions. As the apron I read says, "Many have eaten here but few have died..."
Here you can link to smoking techniques I have found to work well and also download some of the recipes I've settled on from the links to the right. Below is the story of how all this came to be. In all kinds of subjects you always hear lines like, "The Secret to... " Well, sorry, I don't believe in secrets; there are simply things one of us knows that the other has not yet stumbled across. And since I'm not interested in competition only good eating I am happy to pass along my tiny bit of knowledge of this wonderful way to prepare meat. I learned early in my photo career that the really good shooters are not afraid to share their techniques. Not only because they know that hearing the words and doing the deed are two very different things, but also because if you DO get good they may want to ask YOU how you did something someday. The web has made the concept of secrets (of nearly ALL types) passé anyway. So I was able to easily do a lot of research, visiting nearly every smoking site I could search out. But I also did a lot of experimenting with my friends for the Guinea Pigs. Different marinades or rubs, different mop sauces, different types of wood, and, of course, different cuts and types of meat. I found and would tell you emphatically that the key is lots of your own experimentation. What you read someplace, including here, may not result in food that is perfect for your own tastes. That was certainly true for me. Some of the results of that experimenting flew directly in the face of smoking 'wisdom' I would read over and over in online sites and even in books. Other suggestions and guidelines proved dead on and I violated the "rule" only to have things go astray. But since I'm now a teacher by trade, this page is devoted to passing along whatever seems to work really well for me. Beyond that I make no claim for it and certainly do not claim to be an expert at this. In the right hand column are links to the recipes I've developed into what appears to be the (for me) final version so I can move on to try other things. Below I'll try to pass on what I've learned about the process itself independent of the dish I am preparing. If you are a smoking guru yourself (folks tend to find each other's sites regularly) and something I say contradicts something you have written, I can only say that I probably read your material and tried it, experimented with it and for me (with all of the variables at play here) what I have written below has resulted in the best meals according to my experimental guinea pigs. Perhaps the difference is all in the wrist -- how I hold a spatula or set of tongs -- who knows? Below then are my growing list of not-so-secret techniques. Some follow conventional wisdom, some do not. You have to try for yourself and see what works for your taste and your equipment. Timing is...Well... Everything! This is common wisdom that you will read in every smoking guidebook. But it is so absolutely true it is worth repeating. The main key to tender meat is cooking it very, very, very S-L-O-W-L-Y. Keep the cooking chamber at around 200 to 225°F and take however long it takes. I started out relying on the thermometer that came with the grill and a meat thermometer - certainly better than nothing. But then purchased a special remote smoker's thermometer that gives temp for both the cooking chamber and the meat. I quickly learned that BOTH of my other thermometers were off, but especially the grill thermometer. I had been cooking too hot by over 20-25 degrees and therefore too fast. With the first meal done at the right temp the meat was noticeably more tender. When trying to plan for guests to arrive I start from the rough estimate that it will take 30-45 minutes per pound to smoke then another 30-45 minutes to let it "rest" (see below) before carving and putting it on the table. That usually gives me a reasonable buffer to have time to chat and let them see the now beautiful hunk of meat in the smoker before it is pulled to rest. Rest is good for the Palate Another bit of common wisdom that has proved to be even somewhat of an understatement, is the recommending a resting period after the cooking and before carving. The truth is the longer you can give the meat, up to about an hour, the more even the internal temp, the juicier, and the more tender it will be. The trick is is not letting it get too cold or letting the juices run out. So don't go poking it or putting the thermometer hole on the bottom. Wrap it COMPLETELY in foil (some wrap first in cellophane and then in foil) and put it in a warm place. I preheat a cooler or even sometimes the microwave by taking a wet towel and heating it to where I can barely handle it then place it and the meat in the "resting chamber." (If I will need the microwave to cook some other item I use the cooler.) Then I finish off the "gravy" ('serving sauce' for the delicate of constitution) using the remaining mop sauce as a base. Wait AT LEAST 30 minutes and more is better (see the story in the right-hand column) before carving. Despite warnings I read in several places, I've never yet had the meat get "mushy." I recently learned that more resting time is better. I prepared a pork loin roast that was to be taken to a friend's place to be finished off. I pulled it from the smoker at 125° internal temp thinking we could finish it off on their large gas grill. I wrapped it in foil, placed it in a small cooler with the hot moist towels and off I went. But it ended up being almost an hour and a half before we were able to eat. I tested the temp when I got there and it was now 140°! We quickly placed it in a large toaster oven, still in the foil, and simply turned it to about 150°-200° to hold it till we could get back to it... and in the confusion of this totally different approach and preparing other stuff, forgot about it. I was so afraid it would be dry, but it came out incredibly juicy and fork-cuttable. Keep it Moist Well, here I borrow from one technique and ignore other bits of advice. I place my meat a little to the side away from the fire box and toward the chimney. Borrowing from other types of smokers, in addition to the drip pan I also place a shallow pan of water right over the exit from the fire chamber into the cooking chamber to provide more steam and moisture. But I also am a big fan of keeping it basted. In addition to the seasonings forming a good crust, I want the oil, and especially the wine, to seep into the meat so the acids can continue their tenderizing effect. So I do not let my meat alone once started, I baste it every 20-30 minutes. Does the cooking chamber temp fall? Of course. But it is such a quick fall then quick recovery that the meat never reacts to it and if it slightly prolongs the cooking time then all that will happen is the meat will be a bit more tender. I can live with that. And the result has been tender, juicy meat with a wonderful seasoned crust that not only adds to the flavoring but also serves to keep juices in. Even people who want the rarest portions tend to also really like the "end cuts" for the flavoring. You can download the recipes for the ingredients in the mop sauces and marinades but they all share something in common, a base of good olive oil and some type of wine. The oil is a good base for the seasonings and the wine not only adds a hint of flavor but the acids in it help break down meat fibers and tenderize it. But don't overdo it. Seasonings should blend and accent the actual meat flavor. If the only thing you can taste is seasoning then either you have too much of it or you need to buy your meat elsewhere. I make the mop sauce the day before when I am preparing the rub or marinade. I mix it and reduce it slightly on the stove then let it sit overnight to blend the various seasonings. Buy Top Quality Meat...Fresh. Find a good meat market and buy prime or choice beef. Pork has no official grading like beef but the better markets are more selective about their other meats as well. I try to buy the meat a day or maybe two in advance then often I will let it sit in the fridge with the rub or marinade for the last day before I cook it. Of course I have done my share of meat that was frozen. Sometimes a great buy cannot be passed up. It certainly does not ruin the meat by any stretch of the imagination but it is just slightly less tender and slightly less flavorful than unfrozen meat. So if you are going to the trouble to smoke it in the first place in order to extract the maximum flavor and tenderness, then take the extra step and whenever possible, buy it fresh and buy the best. I hate the drive to the meat market since there are only a couple good ones in my area and neither are handy. But hearing the guests talk about the meal makes it all worthwhile. "Select" meat, the typical grocery store variety, has minimal fat in it so even if you keep it moist from basting, the main flavor will not be the meat itself but your sauce. So what is the point? I like meat, the sauce is simply, well, gravy... literally. Here in the San Diego (California) area there are two places for top quality meat, Iowa Farms (on Mission Gorge Road near I-8) and Seisels (on Morena across from Mission Bay). Both places offer choice and prime meats and a pretty knowledgeable staff. In fact, use all top quality ingredients for this type of cooking. You won't be sorry. Also be aware of a major issue: there is an inverse ratio of flavor vs tenderness in beef cuts. The most tender pieces (Filet for example) have the least flavor which is why restaurants wrap them in bacon. Meat is muscle. Muscle from hard working areas is the most flavorful but also the toughest. For me, the best of both worlds is a cross rib or standing rib roast. Mesquite. Heavy flavor I use mostly for grilling where times are short and there is not time to let the smoke 'soak in' to the meat. Hickory. Similar to but less heavy than Mesquite. I use it a lot for beef and sometimes for pork loin as the main logs. Pecan. Nice Mild flavor that works well for Pork. Maple. Maple is GREAT for hams and pork shoulder but I've started mixing it with pecan or alder for pork loin and I like what is happening..
Oak. I've gotten the Jack Daniels barrel-stave oak from their kegs and also keg oak from some wineries. It adds a nice touch when mixed in with other woods. It is too small and too expensive to use as the main log. Lemon. I pruned a lemon tree in my yard and when the wood dried tried it as a mixing wood. I adds a nice, barely noticeable hint of citrusy flavor and is great with Lamb. Wood Matters Well, we are talking "SMOKING" as a cooking method so that implies smoke. And that implies wood. But there is wood and there is wood. 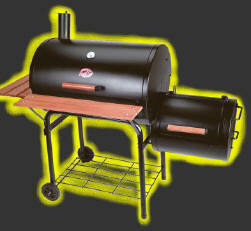 Different types of wood yield different flavored smoke and not all are suitable for cooking. Pine, for example, being laden with turpentine, yields a truly ghastly flavor and it burns too quickly anyway. (Do not grill your steaks in camp over an open pine flame... trust me, you will regret it). Generally any wood from a nut or fruit bearing tree will work but the goal is to maximize the seasoning appropriate for the type of meat. Beef can handle a heavier seasoning than pork or seafood. And some cuts of beef need more than others There are a number of good web-based references to the general characteristics of different kinds of wood and you need to experiment based on your own palate. But for me, the list on the left are the choices I have tended to narrow down. I have recently started to experiment with mixing woods and have been pleased with the results. Like good blended seasoning, it is subtle not noticeable. Remember you are trying to maximize the eating experience and as in most art forms, the thing that makes the product go from good to great is something very small. I also keep some good hardwood wood charcoal on hand if I need to actually raise the temp. It burns much hotter and a whole lot cleaner than normal briquettes which have some nasty binders in them. I use a handful of normal briquettes sometimes to start the fire since it is a lot faster than doing a proper "Fire lay" in the firebox. But then the actual cooking is all done with wood/wood smoke. CHUNKS: Smaller pieces about 2-3 inches in any dimension. I use them as smoke sources not for the main heat. CHIPS: Smaller tinder sized shavings and small twigs that are used primarily as quick smoke sources. I presoak my chips and chunks. And contrary to normal guidelines I do it for as long as possible: sometimes all day. If they are water logged it is OK with me because I want the steam and smoke from them not the heat. Smoking with Gas I have a friend with a beautiful Weber gas grill built in to a gorgeous stone outdoor barbeque area. She has asked me to come over and do some smoked meat on her grill. The first time I mostly smoked it on mine and then brought it over to finish off. That worked OK but I need to try hers. I've seen and read of using non-burning containers to put the wood chips in to set over a burner and provide smoke and obviously that is what will have to be done. If it works (or not) I'll report on it here.